I bet I’m not the only perfume lover who has trouble wearing tuberose. Now, I love tuberose. I adore its bombshell lushness and, whenever I can, I buy stems to keep on my mantel. I adore tuberose in perfume, too. Little beats the first five minutes of wearing Frédéric Malle Carnal Flower, and I can’t give up my Piguet Fracas Parfum, even if I can’t quite wear it, either. Yet, after a tuberose perfume’s glorious first moments, too often I’m ready chew my arm off. Those few minutes of a soprano’s aria that were so beautiful at first, now are grating. Tuberose perfume — on me, that is — is just too much of a diva, and I need relief. I’m happy to report that Aftelier Velvet Tuberose stands apart. It’s a lovely, easygoing tuberose in which a tuberose lover like me who sadly doesn’t wear it well can indulge. Velvet Tuberose’s notes include pink grapefruit, grand fir, transparent florals, tuberose absolute, heady white flowers, creamy sandalwood, damp earth and spun sugar. (Mandy Aftel, the brand’s founder and perfumer, seems to be having fun playing with names of notes with this one.) As is true for all of Aftelier’s fragrances, Velvet Tuberose is made completely of natural materials. Also, it’s a solid perfume. Have you ever smelled tuberose absolute? It’s more vegetal and less polished than I’d expect, and Velvet Tuberose’s green quality reflects that. Instead of a performer at La Scala, Velvet Tuberose is more of a singer walking in the woods, trading polish and sparkle for comfort and self-satisfaction. Velvet Tuberose is simply a plush, green, approachable tuberose pretty much from the first smear on skin to its last quiet breath seven hours later. After the first half hour, I smell a bit of ashy earth, but nothing to detract from the fragrance’s soft, round texture and gentle sweetness. It’s a quiet fragrance, but it lasts a good long time on skin. And that’s about all I have to say about Velvet Tuberose. It doesn’t break new ground, as far as I can tell. It isn’t freaky or surprising. It’s a welcoming, easy-to-wear tuberose that should please a wide audience. Velvet Tuberose works on my skin, and so do deconstructed tuberoses, like Naomi Goodsir Nuit de Bakélite and L’Artisan Parfumer Nuit de Tubéreuse. Shalini also wears well on me. (Maybe tuberose absolute makes the difference?) How are you with tuberose? Do you have any favorites? 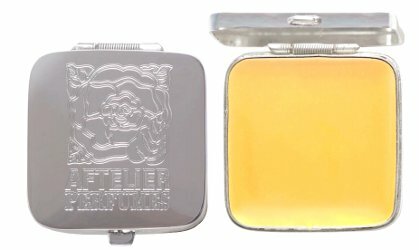 Aftelier Velvet Tuberose is $7 for a .25 ml sample and $240 for 8 ml in a 1.5-inch square sterling silver compact in a silk pouch. For information on where to buy it, see Aftelier under Perfume Houses. Note: top image is Tuberosa [cropped] by Cristian Iohan Ştefănescu at flickr; some rights reserved. Tuberose polarizes me, it frightens me and disturbs my peace of mind really. There is one tuberose that I feel brave enough to wear it with pride & that is Jacques Fath Rosso Epicureo. I like your simple and short description of Velvet Tuberose. Calm, green, a bit earthy sounds like something I could wear. I love tuberose so much in a vase–yet it’s so hard for me to wear on skin! So is gardenia. Sometimes it works, though, as it does here. No one single tuberose perfume has ever worked for me. The note overwhelms and disturbs me greatly. I appreciate Carnal Flower and Fracas and I own them, but I hardly reach for either. I know exactly what you mean! I adore Carnal Flower and can’t imagine not having it. But I don’t wear it often. I’ve never smelled real tuberose, but I adore it in perfume. Funnily enough I never really cared for Nuit de Tubéreuse, not enough tuberose for me. I’m very keen to try Nuit de Bakélite, I love a lot of Isabelle Doyen’s work. On another note: have you tried Moon Bloom? That’s another tuberose that a lot of tuberose haters seem to like. Lucky you! I haven’t tried Moon Bloom, but I’m making a note right now. I’m always surprised that you don’t really enjoy tuberose in perfume more. You tend to like perfumes with a lot of presence and tuberose certainly has that in spades. Still, with perfume you never van tell. I always thought that I wasn’t a great wood or incense lover and yet I fell head over heels with Bois d’Encens. I’m surprised, too! And I do love how tuberose smells–just not on me, for long. It’s sort of like wearing black velvet, I guess. I love black velvet, but it drains the life from my skin. I love tuberose, and want it to love me. I have some vintage samples of Fracas, and I was eying a vintage Fracas parfum on Etsy, but moved too slowly. I do like carnal flower, and I recently got a bottle of Dolce & Gabbana Velvet Desire, which to me smells similar to Fracas. I might give this Aftelier a go. I remember trying the L’Artisian you mentioned, but will need to revisit. For people who wear tuberose well, it’s a wonderful note! I’m interested to hear, too, that D&G Velvet Desire is similar to Fracas. I love tuberose of many varieties: Nuit de Tubéreuse, Tubéreuse Criminelle, Carnal Flower, Café Tuberosa, but oddly I don’t recall smelling Fracas. I think it scared me off before I became a perfumista and I just haven’t sought it out since. But natural perfumes don’t seem to last more than 2 minutes on my skin, so I haven’t pursued any Afteliers. I do like Nuit de Bakélite and it’s on my shopping list for 2018. Nuit de Bakelite is terrific–it might find its way onto my 2018 shopping list, too. I generally find tuberose, as a soliflore, a bit too cool to meld with the skin. Nonetheless, I like L’AP Nuit de Tubereuse and HdP Vamp à New York. I generally like the Aftelier brand, too, so I’ll try to sample this. I completely forgot about Vamp, but it was a huge hit when it came out! I never did sample it, though. I’m a tuberose fan, and I feel that it smells well on me. I have a bottle of Robert Piguet Petit Fracas and it’s the most show-stopping, exuberant, full-of-pizzaz fragrance I’ve ever come across. it seems to explode out of the bottle rather than spray out and I absolutely love it! it’s so glamorous and fantastical, I’ll be damned if it’s ever discontinued. the same goes for Tom Ford orchid soleil, which is another favourite of mine with tuberose in. I love how you describe Petit Fracas! Does the original Fracas work as well on you? It sounds like you’re the person tuberose perfume was made for! I think I may have to grow into original Fracas (I’m 24), as it’s not really aimed at my age group. although I did enjoy Fracas very much and can appreciate its quality and audacity. I can see that–Fracas is definitely a “mature” fragrance. But a classic, too! You are definitely not alone Angela! I too adore tuberose; the real flower or in the form of perfume, but the latter I must admit, I can just appreciate (stand) it on a blotter or someone else. If I wear it for longer than 15 minutes or so, I seem to hit a “tolerance threshold”. Which is a shame because I truly think tuberose is beautiful and majestic, even. From Fracas to Juicy Couture to Michael Kors to name a few, I just can’t .. Your review makes me want to give this a try. Soft, round and gentle are definitely what I am looking for! 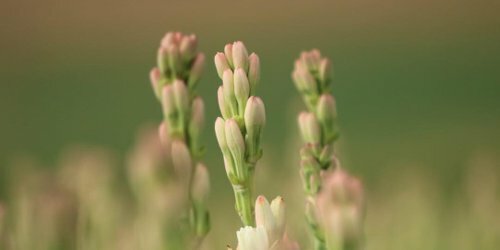 Yes, the “tuberose threshold” for skin! I’m glad to know I’m not the only one who loves tuberose but rates low on this scale. I‘d love to be able to wear Fracas or Carnal Flower — I have samples I love sniffing, but they don’t feel right on me (too green, maybe? I feel uncomfortably close to a greenhouse or florist’s shop). Your menthol tuberoses, on the other hand, are right up my street: I‘ve just swapped for a back-up bottle of Tubereuse Criminelle, and I also wear Private Collection Tuberose Gardenia. My favourite tuberose-with-a-lot-of-other-stuff is Forbidden by House of Matriarch: it has a red dust feel that I love. Oh, a “red dust” feel sounds so intriguing! Plus, I haven’t smelled anything from House of Matriarch. On the list it goes!